Okay, here goes. We can all agree that senseless gun violence is atrocious and that mental health needs to be addressed in our country. Don’t worry, this is not a rant about the Second Amendment. It is, however, a rant about the revitalized call to ban violence in movies, television, video games, and other forms of entertainment. Since some of my writing leans toward the violent, I take exception to this argument. Full disclosure: one of my stories involves a mass shooting. Yet it’s obviously a parable about white collar helplessness, not a story encouraging senseless gun violence. Maybe that’s why “violent books” get a pass in this proposed boycott. Maybe it’s understood that books are meant to teach us something, whereas videogames put your finger behind the trigger. 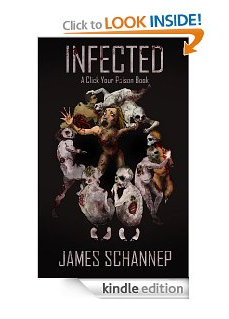 Yeah, well so does INFECTED, my survive-your-own zombie apocalypse book. It puts you at the heart of adrenaline fueled deplorable choices. But it’s adult entertainment, and I think that should be the point. How about instead of banning adult entertainment, we call for parents to take an active role in screening their children’s entertainment? “I think you know there’s violence in the world, tragedies happen, blame the playmakers. It’s a Western. 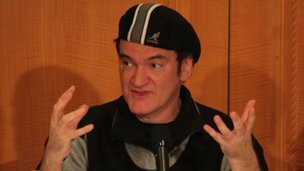 Give me a break.” –Quentin Tarantino, on the violence in Django Unchained. According to BBC, he’s tired of defending his films each time the US is shocked by gun violence. Violent entertainment has never once made me fear for my life. Nor has it made me consider taking the life of another. Just as playing tug-o-war with your dog won’t make him want to rip out your jugular. Riding a roller coaster shouldn’t make you want to jump off a cliff. In fact, it should do the opposite. The itch should be scratched. I think I missed this episode when I was a kid. So here’s the point: If you don’t like it, don’t buy it. And if you don’t think your kids should watch it, don’t let them. But don’t try to ban any forms of expression or entertainment. Please. We have rating systems for a reason. Thanks for posting. You are 100% correct; it’s a social issue, not an entertainment issue. Good article, James. I really like you Zombie book. Very ingenious. Sorry for the late response, and thanks!